The life of a UK football fan is hard to explain. I compare it to being a Chicago Cubs baseball fan. Every year we get our hopes up that maybe…just maybe…this will be “the year”! But why is that? Why does a large section of the UK football fan base truly believe that the Cats are doomed to fail? I think it would take all of the world’s best psychologists to study the mindset of the UK football fan base to figure out why we not only fear the worst, we often expect the worst. I admit that I struggle with this. I love everything about being a UK football fan. I love the tailgating, I love going to the games, and I’ll go no matter if they win or lose. BUT…and it’s a big BUT…I admit that it just seems like every year the “rug gets pulled right out from under us”. Our hopes get up, and we often get disappointed. It makes me sad. I want this program to win and win a lot! I want to be a force in the SEC, but how and when will it happen? reporters’ questions after the game. He said some things that still haunt me to this day. We’ve been close a few times. Tim Couch’s record setting season in 1998 lead to the New Year’s day appearance in the Outback Bowl. The entire Commonwealth went football crazy. My colleague, Larry Vaught from “Vaught’s Views”, had always told me that, “Kentucky is really a football state!” The way the UK fan base responded during the 1997 football season was proof of what Larry had been trying to convince me. We were also close at the end of the “Rich Brooks era”. Every year ended with a bowl game. Every year seemed to include a big monumental win, including the historic win over #1 LSU in 2007. The fan base was happy. Which leads us to this season. I’m anxious to see how this season unfolds. For the first time in a long time, Kentucky actually has more talent than 3 other Southeastern Conference teams on their schedule – Vanderbilt, South Carolina and Missouri. Adding to the optimism is the fact that the Vandy and South Carolina games are at Commonwealth Stadium this year. 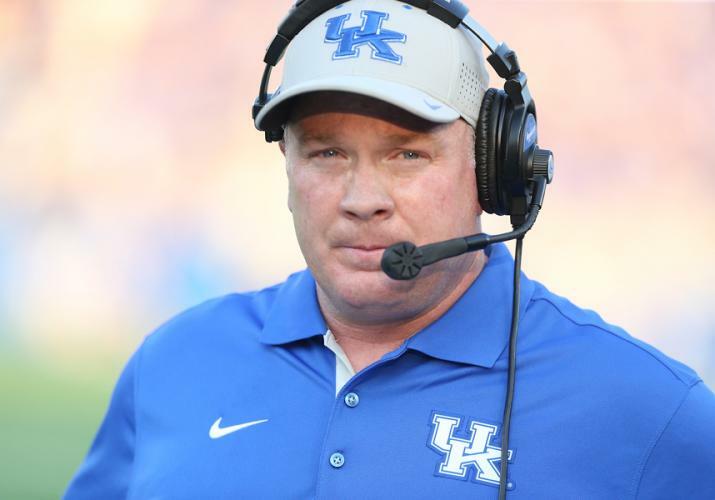 I strongly believe that Mark Stoops is the best man to be the head football coach at Kentucky. Stoops and his staff have been recruiting at a level that we’ve never seen here at UK. The talent level is way up. Stoops is doing something that I thought for years couldn’t be done here at Kentucky. I said many times, “It is impossible for UK to recruit against the ‘big boys’ in the SEC.” Stoops and company have been proving me wrong. The coaches are better. The players are better. The stadium is better. The facilities are better. We’ve run out of excuses. Now it’s time to go WIN!